Permanent Endowment grant recipients at ceremony Tuesday. 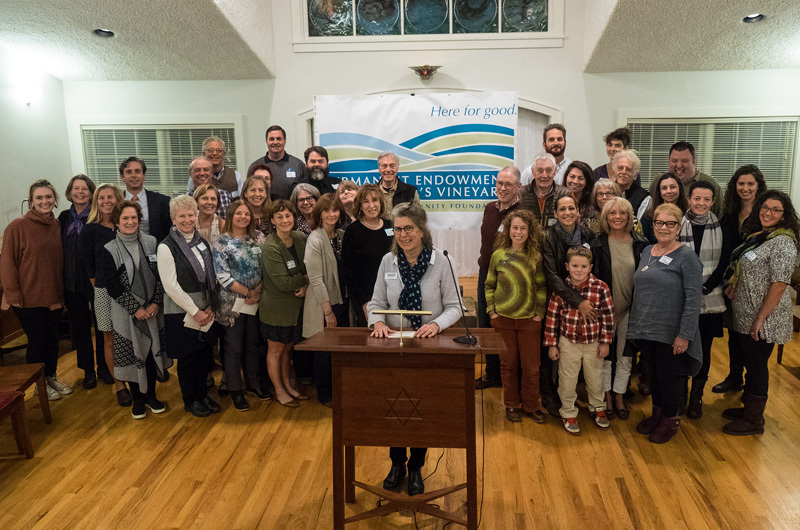 Nearly 30 Island nonprofit groups and community programs enjoyed a spotlight moment Tuesday evening, when the Permanent Endowment for Martha’s Vineyard presented them with more than $125,000 in grants during a fast-paced awards ceremony at the Martha’s Vineyard Hebrew Center in Vineyard Haven. Recipient groups ranged across the spectrum of Island causes and concerns, from early childhood education to senior services. The venerable Vineyard Haven Band, founded nearly 150 years ago, won an outreach grant to recruit musicians, and Felix Neck Wildlife Sanctuary received funding that will help create teaching gardens for a nature-based preschool in years to come. “We have been part of growing up Vineyard for the last 54 years,” Felix Neck director Suzan Bellincampi told the audience. “What we’ve found is that kids can get so excited about seeing birds and bees and caterpillars and so as part of our education we wanted to provide habitat gardens,” featuring birds, bees, pollinators and fragrant plants,” she said. The Permanent Endowment board of directors granted Tuesday’s awards from a dozen different funds. 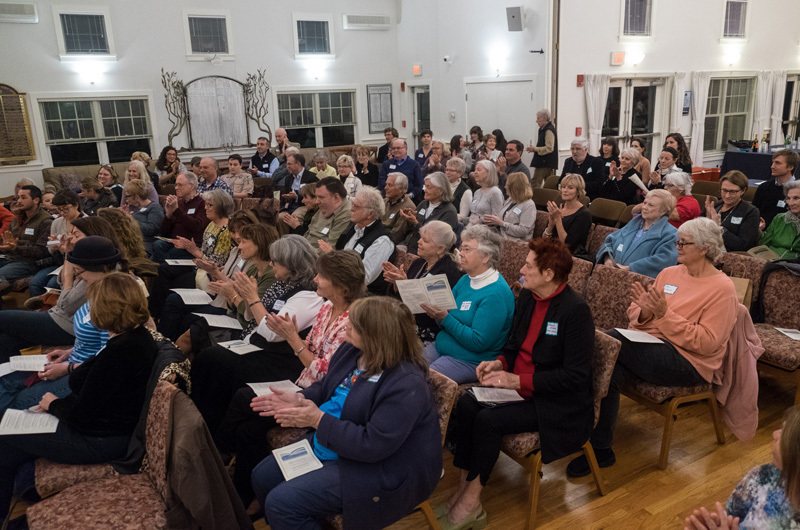 The oldest dates to 1923, when a summer resident named James P. Cahen passed away, endowment executive director Emily Bramhall told an attentive crowd at the Hebrew Center. “Mr. Cahen left a bequest of $5,000 with instructions to let it grow to the point it could provide free medical and surgical aid for all the residents of the Island — a worthy goal then and now,” Ms. Bramhall said, as her audience laughed wryly. This year, the Cahen Fund contributed $7,950 to the Martha’s Vineyard Center for Living’s new Dementia Community Education Initiative. “The community as a whole will benefit from a lot more understanding of this disease and how to manage, and also how to recognize and support families in the community” who are affected by dementia, Center for Living executive director Leslie Clapp said as she accepted the donation. Other charitable funds under the Permanent Endowment umbrella include the Lillian Hellman Recreational Fund, established by a 2009 bequest from the author to support activities for school-age children on the Vineyard. Island Grown Schools, a program of Island Grown Initiative, was awarded $4,750 from the Hellman fund to get more middle-school-age students interested in farm-to-table activities such as school gardens and the Harvest of the Month cooking series. The Joy Fund, founded in memory of special education teacher Joy Flanders by her daughters, contributed $2,200 to the Vineyard Independence Partnership, a social and mutual assistance group for Islanders with special needs. Sailing and shellfishing also got a boost, with the Lagoon Pond Association, Martha’s Vineyard Shellfish Group, Sail MV and Shenandoah Foundation dividing $21,650 from a fund established by Harriet N. Goldman. Among the funds that granted awards this week are four new ones, created by the foundation board in 2017: the Island Funds for the Health, the Environment, Community and the Arts. “You might ask, where is education in this? We see education as a component of all these areas,” Ms. Bramhall told the Hebrew Center audience. Most of the current grants from the Island Funds are going to education-oriented causes such as Biodiversity Works’s high school field biologist intern program, business administration courses at Adult Community Education (ACE MV) and professional development for early childhood education teachers at Martha’s Vineyard Community Services. “We haven’t forgotten education, it’s just a part of everything else that happens here,” Ms. Bramhall said. 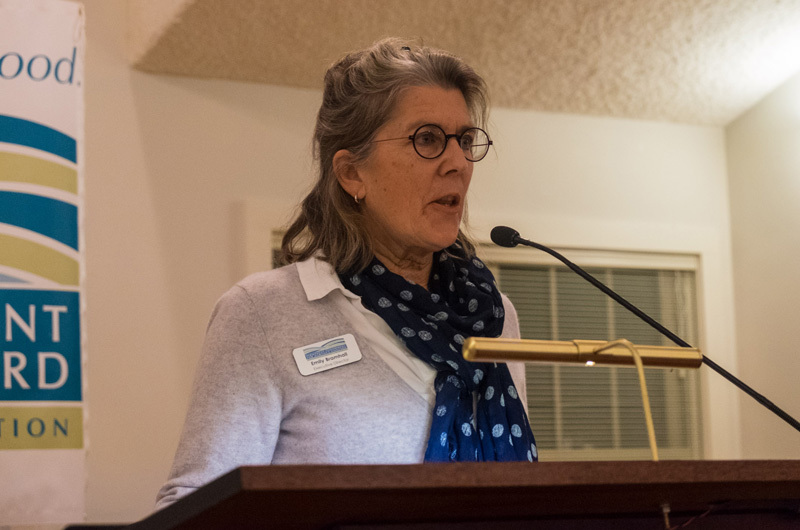 The Permanent Endowment for Martha’s Vineyard was founded in 1982 to support the Island’s environment, arts, community and health, Ms. Bramhall said. It now consists of 45 distinct funds worth more than $11 million. The $125,000 in grants announced Tuesday represent the lion’s share of nearly $280,000 the foundation awarded during 2017, according to the evening’s program. The total was divided into $25,910 for environmental work, $52,016 for the arts, $62,154 for health care and $139,663 for community groups and programs.